Leonard Hutton Galleries, New York. Private collection, Germany, by whom acquired in 1997. The artist's handlist, IV, no. 511. W. Grohmann, Wassily Kandinsky, Life and Work, Cologne, New York, Paris and Milan, 1958, p. 338 (illustrated p. 360 and 379). H.K. Roethel & J.K. Benjamin, Kandinsky, Catalogue Raisonné of the Oil-Paintings, vol. II, 1916-1944, London, 1984, no. 956 (illustrated p. 871). Lucerne, Galerie Rosengart, Kandinsky: Paintings, Watercolours and Drawings, 1953, no. 6. Cologne, Wallraf-Richartz Museum, Kandinsky, 1958, no. 35. Baden-Baden, Staatliche Kunsthalle, Wassily Kandinsky: Gemälde 1900-1944, July - September 1970, no. 102 (illustrated). Verona, Palazzo Forti, Monaco, Mosca, Bauhaus, Parigi, July - November 1993. 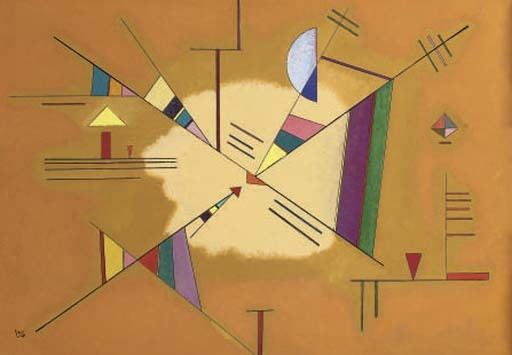 Diagonale (Diagonal) is a masterfully executed, almost engineered composition that Kandinsky made at the height of his involvement with the Bauhaus in May 1930. Centred around a rather mystical looking splash of warm sunlit colour, it explores the inner dynamics of diagonal and triangular form held into a steady balance by the rectangular bounds of the picture frame. After Johannes Itten's departure from the Bauhaus in 1923 and the subsequent appointment of Laszlo Moholy-Nagy, the revolutionary German art school had gradually taken a new direction away from its emphasis on individual, spiritual and largely hand-crafted art towards the creation of more universal, industrially mass-produced and functional products. This tendency to unite art and technology increased with the school's move to the industrial city of Dessau in 1925: while many of the Bauhaus' craft workshops, such as pottery, bookbinding and stained glass, were closed, new technical departments, such as those teaching architecture and photography replaced them. Kandinsky, after completing his theoretical work on Punkt und Linie zur Fläche (Point and Line to Plane) in 1926, embraced much of this new technically-orientated direction within the school and indeed, in this new climate, made many of his finest works. Working in particularly close collaboration with his friend and old Blaue Reiter colleague Paul Klee, Kandinsky's art increasingly adopted the analytical hard-edged geometrical forms of industry and engineering. This led him to define a new intuitive approach to the constructivist aesthetic, then prevalent throughout much of the European avant-garde. For Kandinsky, painting was an art that both reflected and gave an insight into the organising force of nature. To feel the affinity between the elements and laws of the Arts was for him to gain an insight into the elements and laws of nature and vice versa. Such an understanding would, so he felt, ultimately pave the way for a synthesis of all Arts of the spirit and transcend all specialization in the name of culture. This is principally why he taught at the Bauhaus and why he and Klee taught many disciplines other than painting. 'The separate and individual laws of those two great realms, nature and art' he wrote, 'will ultimately shed light on the general laws of the world and its makeup...and reveal the independent operation of both within a higher, synthetic sequence of external and internal.' (Wassily Kandinsky, Punkt und Linie zur Fläche, 1926, Berne, 1955, p. 117). Kandinsky had come into contact with constructivist principles earlier than most European artists and directly during his return to his native Russia between 1916 and 1922. He was, however, fundamentally opposed to their suppression of all feeling, emotion and intuitive logic in their work. The abandonment of this, he asserted, reduced their 'calculated constructions' to mere 'mechanics'. 'Art is never produced by the head alone' he insisted, 'We know of great paintings that came solely from the heart. In general, the ideal balance between the head (conscious moment) and the heart (unconscious moment - intuition) is a law of creation, law as old as humanity.' (Wassily Kandinsky, 'Art Today', in Cahiers d'Art, Paris, 1935, p. 83). Towards this end, Kandinsky's art was always rooted in an intuitive grasp of his media, even at the height of his involvement with the seemingly cold objective and functional principles of the Bauhaus. It was of paramount importance, he insisted to counterbalance the complex principles of construction and form that he had painstakingly formulated over several years and finally published in his treatise Punkt und Linie zur Fläche with a spontaneous and intuitive form of creation. He therefore often admitted to almost never applying his own theories to the creation of his work. Intuition was, what he described as the artist's 'inner necessity' without which even the most perfectly constructed picture would be a 'dead canvas'. His approach of combining complex theoretical preparation and study with an intuitive denial of it was, he recalled, something he owed to his first drawing teacher in Russia who had similarly forced the study of anatomy on his students. 'You've got to know anatomy properly' he told Kandinsky, 'But woe betide you if you think about anatomy in front of the easel! When he's working the artist shouldn't think!.' Kandinsky recalled, adding, 'I have followed these two suggestions to this day and have remained true to them to the end' (Wassily Kandinsky, quoted in J. Hahl-Koch, Kandinsky, 1993, p. 302).